If you have a regular yoga practice, you know how debilitating it can be to try to practice with any kind of digestive issue or acid reflux. But what if the practice itself could help you address those issues? Because yoga combines exercises with mindful breathing, it helps the body detoxify from things such as an unhealthy lifestyle, accumulated stress or the wrong diet. Mayurasana is an advanced pose, but even if you do a modified version of it (forehead or knees on the floor), the pressure on the digestive organs halts the flow of blood temporarily. When you release the pose, a rush of fresh blood flows through the organs, improving their function and moving anything that might be “stuck.”. Some gurus say that the consistent practice of this pose allows the yogi to eat anything and have perfect digestion! Trikonasana stretches through the spine and stomach, which improves digestion, stimulates appetite and alleviates constipation. Pavanmuktasana is awesome if you struggle with sluggish digestion, or if you have trapped wind. Take this pose slow, and be sure to combine it with your breath; exhaling as you draw your knees into your chest, and inhaling as you allow them to flow away. I also recommend practicing this one before going to bed. In general, twists are helpful for improving digestion, and Ardha Matsyendrasana has a specific ability to cleanse the digestive system. 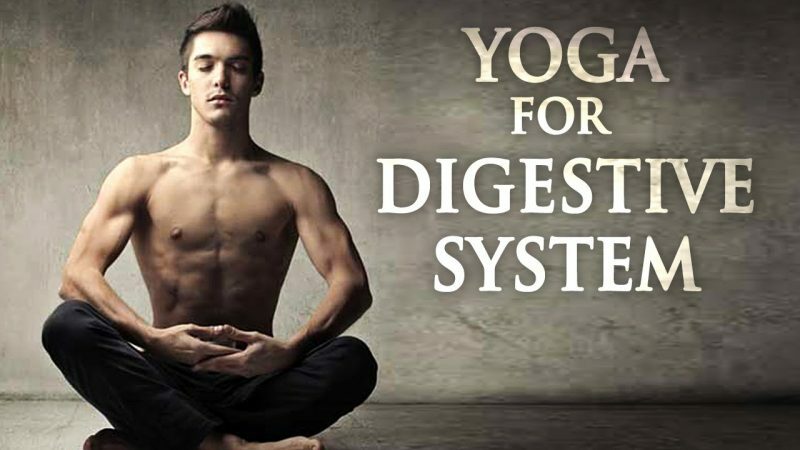 Some yoga masters suggest that you twist to the left and then the right in order to compress the upper GI tract before the lower one, those forcing any stuck or undigested food through the system. Paschimottanasana is amazing for stretching and lengthening the back, but if you add a little prop to it, it can greatly aid to digestion. By placing a bolster or pillow across your thighs, and resting on it when you fold forward, you allow space for a digestive massage to take place. Ustrasana stretches the stomach and intestines, alleviating constipation. In Savasana, your heart rate and breath slow down, thus increasing oxygenation to the digestive organs. Plus, you are tapping into your parasympathetic nervous system thus creating a healing environment for the body. How Does Yoga Help Combat Acid Reflux? A regular yoga practice strengthens the digestive system and ensures proper functioning of all the organs. It also improves blood circulation, which means fresh oxygen and better nutrient absorption. Marjariasana and Bitilasana strengthen the core and spine and the abdomen, which enhances blood flow and massages the digestive organs. 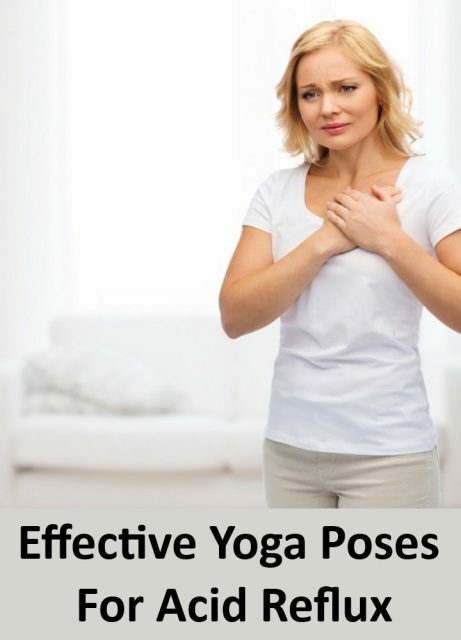 These poses can provide immediate relief from acid reflux. Adho Mukha Svanasana is a relatively low-impact inversion that oxygenates your abdomen and can relieve the burning sensation of acid reflux. Virabhadrasana II strengthens the digestive system, relieving acidity. It also helps to ensure proper functioning of digestive organs. Ardha Matsyendrasana flushes out toxins and increases blood circulation, which oxygenates your digestive system and reduces acidity. Balasana is a restorative pose that relaxes the system and relieves bouts of acidity. When you are in this pose, your abdominal organs are massaged and strengthened. You can also make other lifestyle changes to lessen your reflux without the use of medication. Raise one end of your bed. When you lay down, acid reflux can worsen and irritate your esophagus. See here for a review and comparison of the best bed risers. Eat smaller meals and keep a food diary to track which foods seem problematic. Some common trigger foods include chocolate, nightshades, peppermint, citrus fruits, onions, and garlic. Be sure to drink a lot of water with meals in order to dilute stomach acids. Avoid alcohol, fruit juice, tea, or anything carbonated. Maintain a normal weight. Added pounds may put pressure on your stomach and push acid into your esophagus.